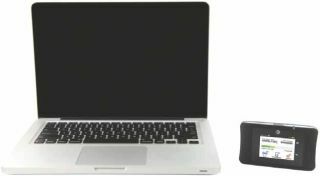 AT&T UNITE PRO is a mobile hotspot device offering simultaneous connection to the Internet for up to 15 mobile devices. Quality and Effectiveness: The AT&T next-generation hotspot is reliable and robust enough for daily use for up to 15 devices. It is lightweight and includes touchscreen navigation. The device also has several sensitive buttons on the outside case to turn it on and off and navigate easily back to the home screen menu. The screen goes dark after a few minutes to save power, but wakes easily when the power button is touched. In my experience, the battery charge lasted about 24 hours and it does not drop connection to devices even when the battery is fully drained. Ideally, students can create content on their mobile devices, such as taking notes, recording audio or video, or sharing or saving to the cloud. Ease of Use: This updated hotspot is easier to use than its predecessor and includes more functions. The device can also serve as a battery boost to other mobile devices. New users will learn to navigate quickly. The printed instructions are simple and clear. If questions arise, online tutorials are also available. Creative Use of Technology: AT&T updated this device with attention to forward-looking design possibilities and users’ requests in mind. The extended battery charge and the easy navigation will appeal to teachers and administrators alike. The hardware icons and touchscreen graphics are easy to recognize and foster a sense of confidence when setting up and using the device. Suitability for Use in a School Environment: This device would be invaluable on school trips or when students are away from the classroom and expected to create content, keep up with homework, and conduct online research. For example, when students tour museums or art spaces, an assignment could prompt them to search for more information about an artist, make reflective notes, and snap pictures of their favorite pieces. OVERALL RATING: This latest hotspot hardware and software design combines easy navigation, intuitive buttons, and a very long battery charge. Provides exceptional WiFi coverage in a small spaces with capacity for up to 15 mobile devices.